WordPress includes a well-defined workflow for running a blog with multiple contributors in various roles. It works great; But what if you are using WordPress to run a 1,000 page hierarchical site? Well… the workflows available are a bit limited without getting under the hood. For example, WordPress does not define fine-grained capabilities for controlling who can edit published content. As a result, users have to be granted full editing permissions, which increases the chance that a less-experienced user will make an ill-advised change. Drawing from our experience running large Multisite installations, Boston University has developed a couple of plugins to address some of the limitations. And for the first time, we are planning to release our plugins to the broader WordPress community under the GPL. This talk will include an overview of the role/capability system presented from both a user and developer perspective as well as overviews of the BU Versions and BU Section Editing plugins. Along the way, various insights will be shared that provide a window into how BU has built an effective content management system on top of WordPress. 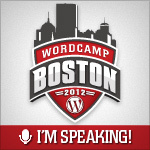 For more information, visit the WordCamp Boston 2012 website.